Are Elephants Afraid of Mice? How Long Do Elephants Live? The Asian elephant is the second largest land mammal in the world and is the strongest of the three species of elephant. Giant herbivores, Asian elephants can tear down huge tree limbs. They have been an important part of Asian culture for thousands of years. Many have been domesticated and are used for various religious festivals, transportation and to move heavy objects. They are endangered under the U.S. Endangered Species Act. The global population estimates are of between 40,000 to 50,000. Asian elephants live in Asia and Southeast Asia in a wide range of habitats, from thick jungles to grassy plains. They prefer areas that combine grass, low woody plants and forests. Their varied diet enables them to live in distributed forests as long as they have plenty of space to move around. Asian elephants can be found in India, Thailand, Sri Lanka, Vietnam and other countries of Asia. Asian elephants are purely herbivores, and can process a wide variety of vegetation, including grasses and herbs, farm crops, fruits, leaves and bark. Asian elephants range from 7 to 10 feet in height. They grow up to 21 feet long, and weigh up to 12,125 pounds. This puts them among the heaviest land mammals on earth, second only to their close relatives, African elephants. Skin color varies from grey to brown. They have a very thick, wrinkled skin with stiff brown hair on the tops of their heads and backs. Elephants have long, muscular trunks. The trunk has multiple functions such as grabbing objects such as branches, breathing, drinking or spraying water. One of the ways to distinguish Asian elephants from African elephants is through their ears, which are much smaller than ears of African elephants. As compared to African elephant, they are also shorter with rounded backs. Asian elephants are highly social and form strong bonds with other herd members. They often stay in herds as it helps in protection of the elephants, especially newborns. The herd is led by the oldest and often largest female in the herd, also known as the matriarch. Males usually leave the herd at the age of 12 to 15, and may lead solitary lives or live temporarily with other males. They use their trunks to communicate, touch, eat, drink or breathe while in water. Female elephants reach sexual maturity in between the age of 6 to 10, whereas, the male elephants reach at the age of 10 to 12. 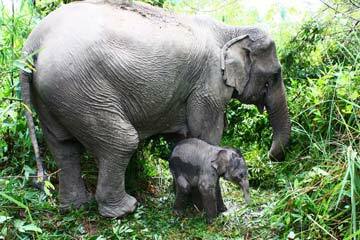 The gestation period of female Asian elephants is about 21 months. They usually give birth to one calf, rarely twins are born. At birth, the mother is attended by other adult female elephants. Newborns weigh around 220 lbs, and can stand immediately after birth. In the wild, Asian elephants may live up to about 60 years but most do not live that long. Elephants tend to not live as long when they are kept in captivity.